For runners and athletic people, a digital sports watch can be an invaluable tool. 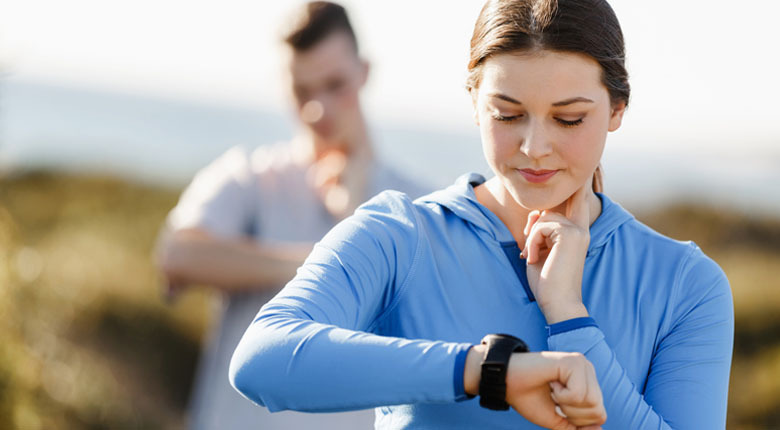 Easier to read than a traditional analog watch, many digital watches have numerous advanced features that can be invaluable to the serious athlete. That said, digital watches come in all shapes, sizes, and prices, and the adage “you get what you pay for” definitely applies here. A lot of digital watches, especially cheaper ones, are not very good, with the straps in particular often being problematic. A watch that doesn’t stay on your wrist won’t do you much good. We created this list as a guide to help you find the best digital sports watches on the market. We can’t report on all of them, of course, but these ten are all capable watches that run a wide range of budgets. If you’re shopping for a watch, read this guide first. If you’re more interested in analog sports watches, we have a guide for that one as well. When it comes to watches, there aren’t too many critical things to be concerned with. Does it keep time? Check. Does it stay on your wrist? Check. However, depending on your individual needs, here are some things you might want to look for. If you are a swimmer, and particularly if you’re a swimmer who trains for athletic events of some kind, the ability to function underwater is of paramount importance. Some cheaper sports watches may not work well (or at all) under water, so if that is something important to you, you should pay attention. Having a timer that can record runs, laps or other vital statistics may be of great importance to an athlete. How long did it take you to run that mile? Even if you don’t compete in any professional sphere, a timer is still helpful, as it allows you to gauge your progress from one day and week to the next. If you’ve ever bought a cheap watch from a discount store, you probably know that the watch is only as good as its strap. After all, if a watch can’t stay on your wrist, it won’t do you much good if you’re running a lap and it’ll do you even less good if you’re swimming. Therefore, having a durable strap is of paramount importance for any sports watch. Not all display screens look the same. Some of them can be downright hard to read. If you’re the sort of person who struggles with that, take a good long look at the screenshot. If you can’t read the number on your computer screen, there’s no way you’ll be able to read it while you’re running. Where a sports watch is concerned, a price is likely not a prime concern. Unlike fashionable watches, sports watches place more emphasis on function than on form. Although there are exceptions, most cost less than $20 or $30. With eight of the watches, we recommended all within $10 of each other, picking one that stood out from the crowd that wasn’t $50 was pretty challenging. However, I felt that the Timex Women’s T5K187 Ironman Essential Pulse was just a little bit better than the comparably priced competition. Water resistant to 330 feet and suitable for swimming. Stopwatch features a countdown timer. Strap made out of durable resin. Includes a pulse calculator to determine your heart rate. This cute Casio LW200-7AV Digital Watch is has a classic design that will look great on your wrist. It is a cute watch with a white strap and pink dial. The watch offers a variety of useful function. These include an alarm, stopwatch, and backlit LED. The watch is water-resistant and can go in the water up to 165 feet. While it is suitable for swimming, it is not suitable for diving or snorkeling. This little watch sports a one-year warranty, while the lithium-ion battery itself is rated for a decade. It has a very cute design that should appeal to a lot of girls and women, and it’s pretty comfortable to wear. If you’re looking for a durable watch under $20, the Marathon by Timex is your dream come true. Well, maybe the dream is too much, but this watch has a nice, durable strap that isn’t going to snap any time soon. The watch is water-resistant up to 165 feet, so its fine to wear in the shower or while on a swim, but it isn’t suitable for snorkeling. Some of the features include a 24-hour stopwatch, alarm, a 2-time zone setting, and an Indiglo night-light that displays the time even in low-light. The watch has a striking, eye-catching mix of black, silver, and violet, making it a rather attractive watch. More durable than the LW-200-7AV, this is perfect for anyone who wants a basic, functional watch that’s both attractive and durable. Are you a sports enthusiast who likes to stay fit? If yes, then you need a watch that is made of tough material. The Armitron Sports Women’s 45/7012NVSV Digital Watch is a nice, functional watch with an extended diving range. While I don’t think it’s as tough or durable as the Timex Marathon, it is waterproof up to 330 feet and suitable for both swimming and snorkeling, but not for scuba diving. It features an alarm, chronograph, date/day, function, and an LCD light-up screen. What I don’t like about this watch is the screen is kind of hard to read. The design of the numbers is different from a standard digital watch, and so I struggled to read it. It works fine, but since I don’t swim, I’d prefer a watch that’s easier to read. This is a very tough looking watch, and it can take a beating. It has a durable wristband that resembles the tread of a tire while the pink dial surrounding the watch face adds a touch of femininity. What I first noticed about this watch is its face is very striking. It has a very modern, stylish design that separates the time, date and other vital information, making it easier to read all the information present on the screen with a quick scan. This lightweight, a durable watch has a variety of basic functions. Its digital display can be set between two different time zones, and it can switch the display between military and standard time. It also features a countdown timer, lap recorder, chronograph, and alarm. The Armitron Sports Women’s 456984PNK Chronograph Digital Watch is water-resistant up to 50 meters (165 feet), making it viable for swimming but not snorkeling or scuba diving. This sports watch weighs just 1.6 ounces. Armitron has been making watches for 50 years, which I suppose explains why it’s the third watch by this company I’ve reviewed. They are known for their quality and expertise in watchmaking, as well as their excellent craftmanship and aesthetics. The Armitron Sports Women’s 45/7051CLR Digital Clear Jelly Strap Watch is a perfect example of this. This spectacularly beautiful sports watch is available in four different colors: blue, pink, purple and clear. It has a beautiful silver-toned dial and a variety of useful, if standard, features, such as dual time lap time and an alarm clock. It is also able to be used as a stopwatch. This watch is water-resistant up to 330 feet, so it’s a great choice for swimmers and snorkelers. It has a back light with a built-in three-second delay. All in all, this is a very nice, attractive watch. The Timex Women’s T5K606 “Ironman Traditional” is a bright, attractive watch that is available in a broad assortment of different color schemes. It offers more than just a bold appearance, however, It’s also a very capable sports watch. One of the things I liked about this watch was its lap memory. A lot of cheaper watches can only remember one lap, but the memory of this one records up to ten different laps so you can see how well you’re doing each time. It also has a countdown timer, an alarm clock, an Indiglo watch light and is resistant to up to 330 feet of water. This is a very solid, capable sports watch, and its lap memory makes it especially valuable to runners and swimmers. This Timex Women’s T5K187 is manufactured in the USA. It has an easy to read screen that displays both the time and date, and it comes with several basic features, such as a countdown and an alarm. Its resin strap is both black and durable, and like most other Timex watches it comes with an Indiglo backlight. What separates this watch from the other sports watches I’ve reviewed is that it has a pulse calculator. If you don’t know what that is, it means that the watch keeps track of your pulse as you wear it and uses that to calculate your heart rate. This can be very helpful for athletes who are familiar with the biological complexities of such things. I, of course, am no athlete, so I don’t have much use for the pulse calculator. Nevertheless, this is a very nice, functional sports watch with a valuable feature that can be essential for the health and success of a serious athlete. The watch is rated for up to 330 feet and comes with a two-year warranty. This is another tough-looking watch that too resembles the tread on a tire. The durable resin wristband is designed to last and is not going to break on you any time soon. It’s also comfortable to wear. The T5K8139J “Ironman” has a very striking mix of colors that draw attention to its dials and display. As far as its sports watch features, it has some excellent abilities, such as a 99-lap counter and a 30 lap memory recall. It also has a 24-hour countdown timer, and 100-hour chronograph, in addition to an Indiglo backlight and the requisite alarms that all watches have. The watch is made in the USA and is rated for 330 feet. If you’re looking for a tough watch with a lot of memory for recording lap times or for continuously lapping forth, you can’t go wrong with this one. It even has three different color options, so if you don’t like the black, purple and yellow you don’t have to live with it. It even has an occasion mode that allows you to store up to 15 different events, perfect for those athletes who have not been blessed with superior memories. This Timex Ironman Watch is very similar to the previous watch in function, if not in design. I don’t think this watch is quite as tough as the other, but it has somewhat superior capabilities. Like the last Ironman, this was a 99 lap counter, but it has much superior memory. It has an impressive 100-hour countdown timer and a 50 lap memory, making it easy to review the day’s workout or even the prior day’s exercises. It also sports a 100-hour chronograph; the Timex patented Indiglo night light and 2-time zone settings. The watch is waterproof down to 330 feet and comes with a 2-year warranty. While I prefer the rugged design of the previous watch, there is no doubt that this watch, with its silicon strap, is a far superior piece of electronics. All but the most diehard of users will likely be satisfied with this watch. Unless, of course, it happens to break. The G-Shock Atomic Solar Watch represents the fruits of Casio’s hard labor and time-keeping innovation. Casio has been making strides to power their watches with solar energy and to attune them to the atomic clock rather than through quartz or electronic means of timekeeping. This is the result. The resin wristband is very tough and durable, and the watch offers a sleek, modern design that is sure to please. What’s exciting is what makes this watch tick, however. It uses a solar-powered battery that recharges itself in the light of thew sun, making it last effectively forever without using lithium-ion batteries that pollute the environment. Even without further exposure to light, this watch battery could survive up to nine months. Also, its synchronization with the atomic clock ensures perfect time-keeping all the time. That’s not all, however. This watch features a fully automatic EL backlight with afterglow, world time in addition to local time, four daily alarms with a fifth snooze alarm, an hourly time signal. Sports watch features include a 1/100 second stopwatch, countdown timer, a calendar, 12 and 24-hour formats. It doesn’t have a chronograph or a lap counter, but it is waterproof up to 200 meters (656 feet), as well as being shock resistant. This watch is a little expensive, and it lacks a few features that sports enthusiasts might want, but it is an amazing watch for water sports, and it can go deep enough even for scuba diving. Highly recommended. There are a lot of excellent watches here to choose from. Whether you just want something cute like the LW-200-7AV, are looking for a tried-and-true dependable beast of burden like the Timex T5K187 or want to spend a little bit more to embrace the latest in technology with the Casio Atomic Solar Watch, there is a sport watch out there to fit every budget and lifestyle. I’ve done my part. Now it’s your turn to make a decision. I know you’ll make the right one.